Uncategorized – Where Are They Now? Kathleen Carty, Where is She Now? Kathleen Carty is a 2017 graduate from SJHS currently attending Trent University where she is majoring in social work. She plans on aiming her focus on medical social work with a specialization in diabetes education. Some of Kathleen’s favourite classes included music and drama, two things she is incredibly passionate about. Carty has also participated in several plays, including Godspell and Sherlock Holmes. Nathan Dyck is a former student at St. Joseph’s. In 2015, Nathan graduated as class valedictorian and is now attending the University of Ottawa for a double major in political science and history. Nathan keeps busy with work, studying, friends, and networking. He is pictured here speaking at model parliament in the House of Commons. In his second year of university he worked part-time on Parliament Hill, volunteering in the office of an MP, but didn’t feel it was the right fit. During the summer of his second year Nathan worked full time in the office of an Ottawa City Councillor as a writer and legislative assistant, learning that he really enjoyed the more hands-on municipal politics. Nathan is currently in his third year of school, working in a co-op position as a research assistant in the history branch of Parks Canada. The job involves supporting the historians in submitting designation reports to the Historic Sites and Monuments Board of Canada. He also writes This Week in History on the Parks website. At St. Joseph’s Nathan played drums with Jazz Band and Blues Guys, while also playing on the basketball team. He still tries his best to continue these activities when he can. Nathan is now working on the publication and presentation of a paper on Dutch neutrality in the First World War for the uOttawa history faculty undergraduate academic journal. He will be presenting the paper at a conference on March 23rd and the journal should launch by the end of April. After university, Nathan hopes to be accepted to a Master’s program for further studies in history. Sabrina Berube Chartrad, A Year In The Future! Sabrina graduated last June with the class of 2016. Since graduating she has been attending Willis college to pursue a career in health care, training to be a PWS (personal support worker.) Sabrina is very happy with where her life is going and very thrilled at the fact that she has been able to keep up her average so far! “My experience at St. Joes was great I met a lot of people there and has a awesome learning experience.” Sabrina along with everyone else who has attended St. Joseph has only but positive comments, and we are so very happy to see where Sabrina’s future takes her. We wish her the best of luck! Ryan Bilson who now works for Brookfield Renewable controlling Hydro and Wind generators was a guy who graduated from SJHS in 2012. The program was a 3-year program for Algonquin College Electrical Engineering Technology in which he finished last April. Ryan worked with Hydro One for a summer co-op in college. When Ryan was in SJHS, Auto Tech and Construction Tech helped him out for real life problems. Mr. Charkavi and Mr. Lunny were Ryan’s favourite teachers because “they had real field experience in the work force and they were able to teach me how to build a house and build a car from the ground up”, Ryan said. Many people from high school had helped Ryan out like Mr. Lunnex, Mr. Charkavi, Mr. Skelhorn, etc. When Ryan was in high school he as very interest in many things like auto tech, construction, biking, and hockey. He is still interested in auto tech, construction, biking, hockey, and now he likes volleyball, skiing, snowboarding, fishing, and parties. “Life is great, have an awesome job, and saving up for a house”, Ryan said. “Before selecting a University or college, make sure jobs are available, don’t waste money on something you love but there’s not jobs for. Also college is a lot less stressful and a lot more fun than some teachers may tell you”. Rebecca MacLaren, One year left at Trent?! 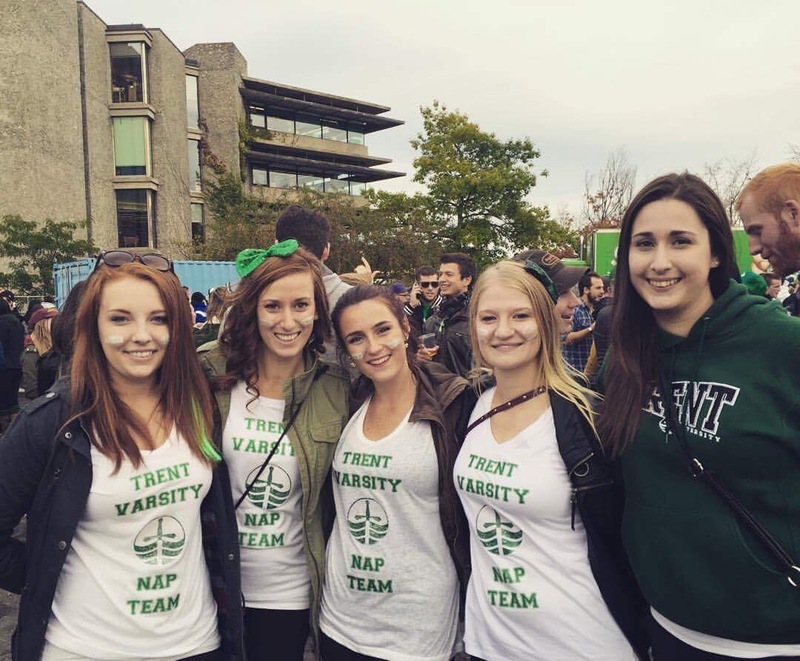 Rebecca MacLaren is in her 4th and final year of BScN (nursing) program in Trent University. Rebecca will be certified as a registered nurse once she writes her NCLEX after she graduates from her last year at Trent. Rebecca applied to Nipissing, Trent, and Loyalist College for nursing. She had gotten accepted to all! She did accept an offer at Loyalist but quickly switched over to Trent last minute! While she is finishing her last year, she plays competitive volleyball and recreational basketball and much more! Rebecca graduated in 2013 from SJHS. She had brought up the nice small sized classes especially math and science, she loved the small classes and how the teachers genuinely care about a students success. Rebecca participated in many sport teams like basketball and volleyball, she also was apart of the Dominican Republic Experience team. Mrs. Turcotte was her ALL-TIME favourite teacher because “she was always available to help, had interesting projects and I found when I came to university for nursing I was better prepared for sciences classes than a lot of other students”, Rebecca said. “Dominican Republic experience through the school was what pushed me towards nursing”, Rebecca said. Rebecca mentioned that SJHS and the amazing staff who were all supportive of her through the high school helped her to get to where she is at now, especially when her dad wasn’t well in her 5th year at SJHS, staff and friends were there for her. All the coaches at SJHS helped Rebecca build strong work ethic and time management skills that she still uses all the time. In school, Rebecca was mostly into sports and not much has changed about that. Rebecca is doing her pre-consolation placement at a hospital in Lindsay, Rebecca is working one-on-one with a nurse on the stroke/rehab floor. She is starting to prepare for exams and start final papers and projects that are due in the next couple weeks. After graduating Collin decided to take a year course in audio production. In 2014 Collin decided to move to the big city of Toronto, recording and playing in many different bands.. Even though it might not be the best financial choice it is a lot of fun and he enjoys it much better than any other job that he could possible have. Collin worked at Tapas for a few years, just to have a bit of extra cash while his music career was getting started up. Taylor Dubeau, Graduating class of 2014! Starting her post secondary career at the University of Guelph right after graduating , Taylor decided at the end of her 2nd year she transferred to the University of Toronto, in Toronto she is learning what it is like to live in the big city. Taylor is currently double- majoring in Sociology and Criminal Justice Socio-Legal studies. ” I think one of the key components to my success is something that I learned from my time in high school, and that’s the importance of forging relationships with my teachers and TA’s, using them as invaluable resources to aid me in getting the most out of my education.” All of the leadership skills that she has learnt from being apart of Student Council helped her to adapted to her new surroundings and helped her grow as a student and making her a very independent young adult. This coming summer, Taylor will be writing her Law School Admission Test, and next fall she will be applying and hopefully being excepted to a law school. Keelin Dowdall was a graduate from SJHS this year, she was a member of the choir, Blues Guys, D.R. team, and many theatres in SJHS. Keelin applied to Laurentian and Trent for Forensic Science, she also applied to Trent for psychology, and she APP,led to Western for Medical Sciences. She had gotten accepted to all but chose Laurentian. Keelin is in her first year but she’s in a 4 year honour program. Keelin isn’t very sure of what she’d like to do but is considering being a forensic scientist, a geneticist, or in some field of medicine, she’d like to stay in the north towards Renfrew to work in the community of her hometown. During her time in SJHS, she felt very welcome. All the teachers had a different significant impact on her life and she feels it would be unfair to choose one as a favourite. “The opportunities I was able to experience at SJHS guided me to decide where I wanted to pursue my education and what educational interest I had in order to figure out who I want to be”, Keelin said. During high school, shenworked as a lifeguard and a swim instructor/lifesaving instructor. SJHS taught Keelin to be resilient and work hard to achieve her goals, taught her to be involved in her community, taught her to be a leader, and expanded her understanding of Catholic faith. Her hobbies and interests now are travelling, singing, drama, photography, outdoor pursuits, and swimming. Keelin seems like a very adventurous person with many talents, I mean, there’s 2 parts of her, she loves singing, drama, photography, then you hear her wanting to be working in a field of medicine! She has so many parts of her that could actually lead to many careers. She has a capability of doing many things and we think it would be great if she worked in the field of medicine, another successful student from SJHS. Natalie Walters is a graduate from SJHS and she’s working at Renfrew Victoria Hospital and Hospice Renfrew as a registered nurse!! Natalie applied to Ottawa U, Queens, McMaster, and Western. She graduated in 2015 from a bachelors of science in nursing from McMaster as of that’s the university she chose out of all the universities that she did get accepted to (she got accepted to all). Natalie enjoys music and sports as of now, which was continued from SJHS. Natalie says SJHS is a good size because you could build close friendships with students and staff. She participated in sports like basketball, soccer, and volleyball. She enjoyed being apart of the musicals, choir, and quartet. Natalie was involved in lots of things at SJHS like those as said and also student council committees, pastoral committee, and athletic committee. Natalie appreciated all of her teachers greatly but she had to point out Mrs. Turcotte because Natalie knew Mrs. Turcotte as a good guide and mentor for a student. She was supportive to Natalie as a friend. “I also appreciated Mr. Hali’s style of teaching, he was always willing to go the extra mile and provide several resources to ensure you were on the right track. You couldn’t wipe the smile odd his face if you tried either!”, Natalie said. “SJHS ensured that I was prepared academically for university”, Natalie said. During high school, Natalie babysat and worked at NoFrills and thought of it as a good experience for her in the future. Learning to work with others. Natalie says her life right now is exactly where she intended to be at her age, she is excited for the future.